There is a tendency to clutter things up, to try to make sure people know something is art, when all that’s necessary is to present it, to leave it alone. I think the hardest thing to do is to present an idea in the most straightforward way. Still, how to proceed is always the mystery. I remember at one point thinking that some day I would figure out how you do this, how you do art—like, “What’s the procedure here, folks?”—and then it wouldn’t be such a struggle anymore. Later, I realized it was never going to be like that, it was always going to be a struggle. I realized I would never have a specific process; I would have to re-invent it, over and over again. That was really depressing. After all, it was hard work; it was a painful struggle and tough. I didn’t want to have to go through all that every time. But of course you do have to continually rediscover and re-decide, and it’s awful. It’s just an awful thing to have to do. Ok, I thought I’d throw this out there. Conceptual or Concept-Lite Artists love neon just as much as painters love canvas and paint. 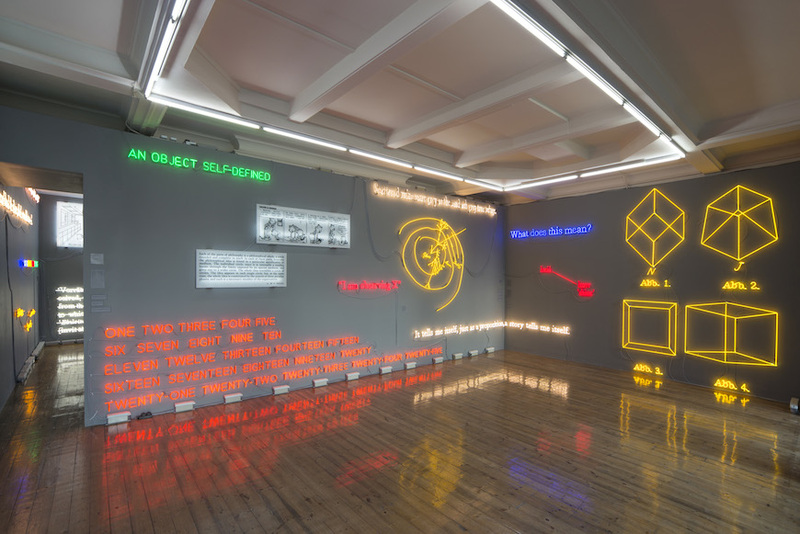 From Nauman to Merz, from Kosuth to Ligon, from Kruger to Weatherford, and goodness me, a whole slew of other deep thinkers use neon to jazz up a pithy bit of text with some roadside signage. These flashy lights can look great in a moody space usually decked out with black or graphite painted walls. I am not immune to their charm. But it seems to me that for all the brave talk from Conceptual Artists about theoretical ideas and process and medium, these artists have set up a whole cottage industry of manufactured neon products. Why? Because the punters love this stuff installed in their upscale renovated loft spaces. Basically this stuff sells and conceptual artists can make series of them so that 10 or 15 collectors can all purchase the exact same piece. It seems to me that we all become merchants at some point in our careers. “Painting can get away with it because of the conservatives of the art market and the fact that external aspects are saying “this is art” – it’s not the artist who’s saying “this is art”. The market is the most conservative dynamic. The painting by a 21-year-old Jean-Michel Basquiat can sell for more than $100m, sell for more than a Warhol, someone who had a massive impact on art history, when Jean-Michel virtually had none – it’s only within the context of millionaire collectors that he has a cultural life. Joseph is right about the market and the institution of a competing art history. Over the last 30 years painting has become a pure economic product, and the philosophic focus behind painting is about that very economics. But in all fairness this art economy is not just about painting, but about the entire “art industry” itself. Conceptual art is sold in the very same market place. It’s valued by the same economic mechanisms. And it exists in and for the same economic center. And to try to create a philosophic difference between mediums is just bad faith. Duchamp may have raised these questions all those years ago, but he never gave us answers to those questions. Nor have his many followers answered these questions, because like any ambitious artists, they must create markets for their work. So what is the procedure?